I grew up with this Polish soup which is traditionally made from ducks and included using the duck blood. Our version is not quite so authentic, actually, it’s been altered significantly for our tastes. Polish Duck Blood Soup? Ick! Well, the concept of the duck blood may be odd to you, but I’m sure the soup is amazing. I’m just not of the liberty to kill a duck and collect it’s blood. I do not think that the traditional recipe would work any other way. So, if this is a Duck Blood Soup, where’s the Duck? Actually, the recipe as pictured was made by me and used Duck. I didn’t feel like buying a whole turkey and waiting for it to thaw. 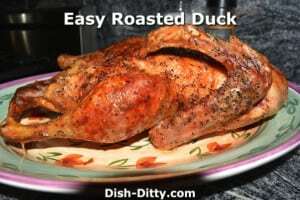 So, I first roasted the duck using the Easy Roasted Duck Recipe. Why did I roast it first? Well, the recipe that I remember my mom making most was from the bones, back, and other turkey parts from our Thanksgiving leftovers. Sure, she sometimes made this soup with raw turkey as described in the recipe. Either way, it was so so good. So, I figured I’d kill 2 birds with one stone and get both recipes written and posted together. A quick note: The Duck did not taste any different than when made with Turkey. So don’t buy a Duck just for this recipe since you can just get some Turkey parts for the fraction of the cost. The difference really wasn’t there. So why did the recipe change to Turkey? From what I understand, my mom, Cherri, did not like Duck. I’m not sure why she didn’t like Duck, it could simply be that it was too expensive for the amount of meat that was on it. Having to feed 6 kids, she’d have to buy and cook 3-4 Ducks to try to feed our hungry brood. Not a very economical option, and my mom knew how to make the money stretch. One of my favorite stories my parents used to tell was of their first Thanksgiving after they got married (just about a month later). Mom made a huge turkey for the two of them and they had turkey everything for a week. According to my Dad, he got so sick of Turkey soup that Mom wasn’t able to make it for years. He eventually got over his taboo of Turkey and Turkey Soup (traditional and Czarnina) became our regular post holiday tradition. I’ve included my mom’s recipe and the traditional recipe. The only thing I did differently from my mom’s recipe for the pictured recipe is to roast the duck. I used about 3/4 of the cooked duck (some of the roasted duck we nibbled on before putting in the soup). But like I said, it’s really not worth it unless you can’t find the turkey legs separately (which was my problem today). 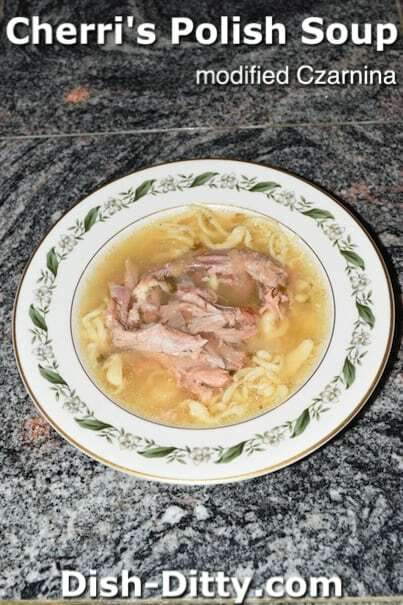 This recipe was adapted from the traditional Polish Duck Soup - Czarnina. Although Duck and Goose were the traditional fowls used in this recipe, any fowl or mixture of fowls will work. T he original recipe also called for the duck's blood to be collected when you kill the duck. If you live on a farm and want to really be traditional, see the Traditional Czarnina Recipe. 1. Any part of the turkey may be used, but either necks or backs should be included for flavor. 2. Any dried fruit may be used alone or in combination. 3. If desired the meat can be stripped from the bone and returned to the soup before the prunes and vinegar are added. 4. Dry French Vermouth is a very good wine for this dish. let the soup come to a hard boil. Place all but the last 2 ingredients in a large pot and cover with water. Bring to a boil. Reduce heat to a slow simmer and cook covered for about 2 hours or until the meat is very tender. Adjust the seasonings and add water if needed. Add the prunes and vinegar and cook for 15 to 30 more minutes. Before serving skim off excess fat. Put 1/2 cup of vinegar in a glass or crockery bowl (not metal). Use this bowl to catch the blood when killing the duck. When the blood drips into the vinegar, stir to avoid coagulation and set aside. In a large stockpot, add the first set of ingredients together (excluding blood mixture, fruit, flour, sugar and cream) and bring to a boil. Reduce heat and simmer. After cooking for 2 hours add the fruit and cook for 15 to 30 minutes more. Blend flour with 1/2 cup of the blood mixture, stir in 3 tablespoons of soup stock and pour into the soup, stirring constantly. Add 1 teaspoon of sugar, 1 cup of sweat cream and bring to the boiling point. 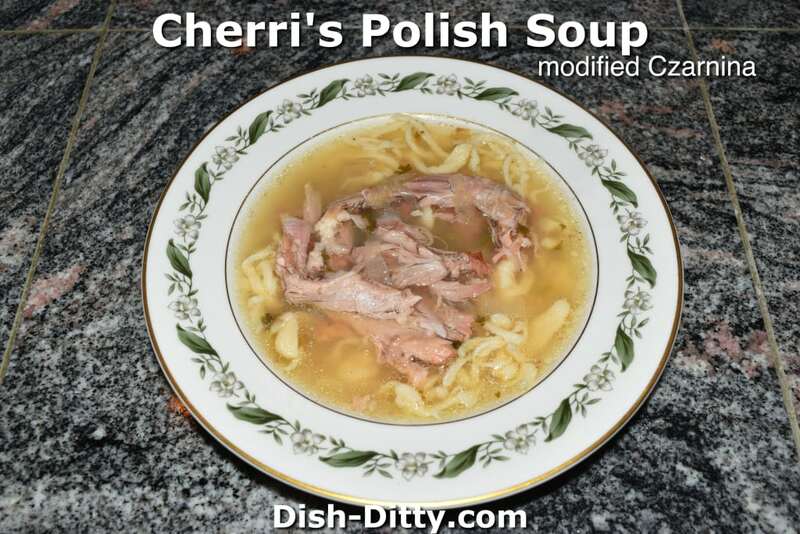 No Replies to "Cherri's Polish Soup (modified Czarnina) Recipe"